Based on SEER database, gastroenteropancreatic neuroendocrine tumor incidence has increased 6 fold from 1 in 100,000 cases to about 6 in 100,000 cases over past 3 decades. North American Neuroendocrine Tumor Society estimates that over 100,000 GEPNET patients are currently living in the United States. One of the common quality of life limiting symptom seen in GEPNET patient is diarrhea. Diarrhea in these patients could be due to excessive serotonin production, secondary to post-operative short gut syndrome, steatorrhea from somatostatin analogs, bile acid colitis or intestinal bacterial overgrowth. A novel amino acid based oral rehydration solution (Enterade) is currently being evaluated in a Phase II clinical trial for antidiarrheal effects in post bone marrow transplant patients (NCT02919670). 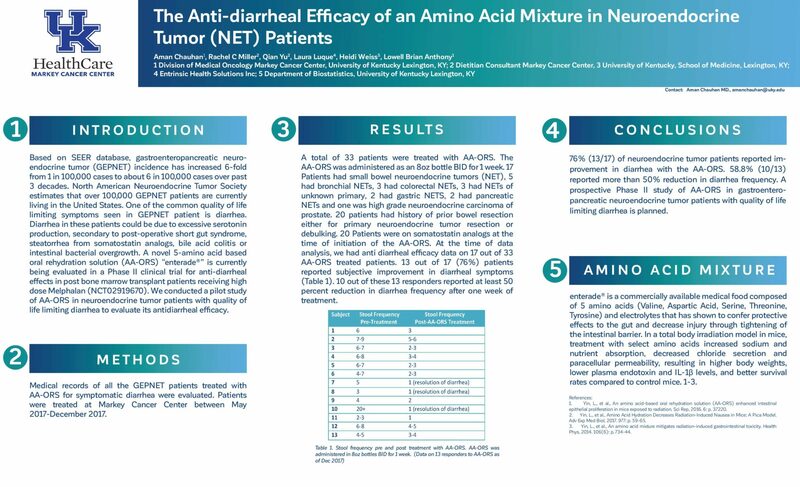 We conducted a pilot study of Enterade in neuroendocrine tumor patients with quality of life limiting diarrhea to evaluate its antidiarrheal efficacy. Methods: Medical records of all the GEPNET patients treated with Enterade for symptomatic diarrhea were evaluated. Patients were treated at Markey cancer center between May 2017-August 2017. Results: Total 8 patients were treated with Enterade. Five were small bowel NETs and 3 were pancreatic NETs. Five patients had prior bowel resections for removal of primary tumor; 5 patients were on somatostatin analogs at the time of initiation of Enterade. Five (62%) patients reported improvement in diarrhea within 6 days of initiating Enterade. The responders had 50 % reduction in their stool output. Mean stools dropped from 6 per day to 3 per day in responders. Conclusions: These pilot data suggest that Enterade may be an effective option in diarrhea control in NET patients. A prospective Phase II study of Enterade in gastroenteropancreatic neuroendocrine tumor patients with quality of life limiting diarrhea is planned.